These wings are by far one of our favorite wings in the city. North 3rd, a gastropub and sister bar to Silk City, is also a staple in the Northern Liberties area. It is never a let-down for brunch, lunch, dinner, drinks or whatever other shenanigans your may be into. Notably, the wings that they pump out here by the pound are consistent, plump, and packed with flavor. 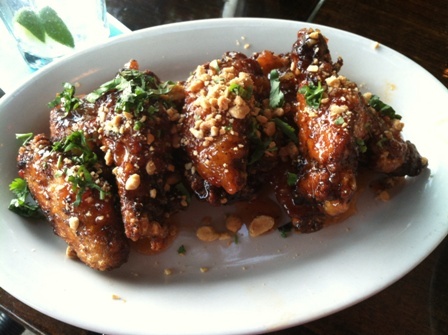 Choices are the North 3rd Famous (which are a spicy buffalo style wing) or the Thai Chili Glazed with peanuts. As seen below, we are rating the Thai Chili Glazed wing and all its glory. This wing does not disappoint. The skin is nicely crisped and the wings are large and meaty. The subtle sweetness and hint of spice of the Thai Chili marry perfectly with the crunch of the peanut sprinkled over the wings. The portion size is also a perk – a pound of these wings will fill you up, but will keep you yearning for more. We give North 3rd Thai Chili Glazed wings 5 BigBite Bites because they are “Mind BloWING”. This entry was posted on Monday, August 19th, 2013 at 11:29 am	and tagged with Must Try, northern liberties, restaurants, Review, Wings and posted in Bite This, Wing King. You can follow any responses to this entry through the RSS 2.0 feed.